Olympic ice dancing champions Tessa Virtue and Scott Moir join guest host Ali Hassan to look back at their journey from being childhood skating partners to the most decorated figure skaters in Olympic history. Olympic ice dancing champions Tessa Virtue and Scott Moir have captivated fans from across Canada and around the world with their story. The longtime skating partners began their careers as young children, officially competing together as partners in 1998. Today, they're the most decorated figure skaters in Olympic history with three gold and two silver medals under their belts. "It's been almost been 10 months since the [2018 Pyeongchang] Olympics and we still pinch ourselves," Moir told q guest host Ali Hassan. "That dream actually came true." This year alone, Virtue and Moir have made landmark career achievements both on and off the ice. 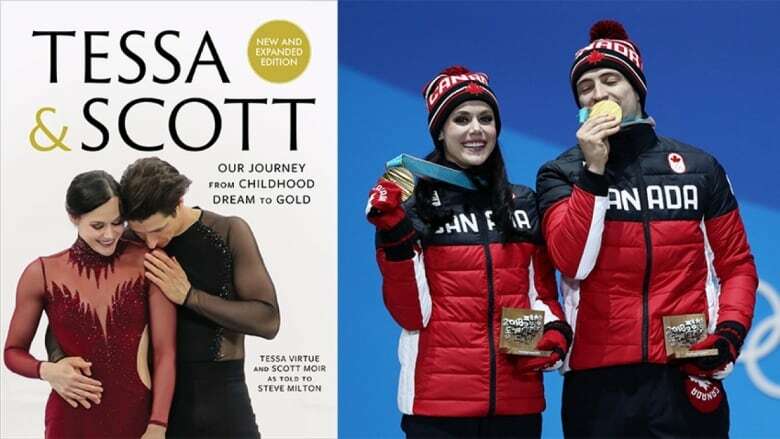 Since their unforgettable performance at the Winter Games in Pyeongchang earlier this year, they've been inducted into Canada's Walk of Fame, performed coast to coast on the Thank You Canada Tour and released a new and expanded book called Tessa and Scott: Our Journey from Childhood Dream to Gold, which was originally published in 2011. In the new and expanded book, Virtue and Moir look back on some of their best-known performances, including their famous free dance to the music of the opera Carmen during the 2012 pre-Olympic season. The sultry performance sparked questions about their relationship and had many fans speculating that the two were actually a couple. Despite the fan reaction, Virtue and Moir, who are not romantically linked, told Hassan that what viewers saw back in 2012 was only the "Mickey Mouse version" of the program, with the original being a lot steamier. "It's funny because people talk about how controversial [the Carmen performance] was," said Virtue. "It was quite sensual and the focus of the storyline was sort of that obsession with sexuality and what we ended up performing was a very, very, very toned down version of the program. Sometimes I wish we had stuck to our guns and just gone with the original vision for the program." "That was a turning point in our career, I think," said Moir. "I wish we would have gone back to it for the [2014 Winter Olympics] and maybe that would have taken us to a gold instead of a silver." Learning from their mistakes at the 2014 Winter Olympics in Sochi, where they were silver medallists, Virtue and Moir said they knew they had to choose music that they felt passionate about for the Winter Games in Pyeongchang. "We knew if we connected to it, then people would connect to us." The result was their gold medal-winning free dance to the soundtrack of the film Moulin Rouge, which captured the attention of viewers around the world and is said to have even created a spike in sales for the film's soundtrack on iTunes. Despite the song's massive popularity among figure skaters, Virtue and Moir said they enjoyed the challenge of taking an "overdone" piece of music and turning it into an original program. "You want to spark a conversation and in today's world it's hard to have something that is in any way shocking or innovative," said Virtue. "That was always one of our goals — to bring something to the ice in an artistic way ... not just for the sake of doing something risky." "We loved skating that program every single day," agreed Moir. "And I can remember being in the last 25 or 30 seconds in an element that was very difficult and we were focused, and I would get misty eyed and emotional just doing it in training in a dirty hockey rink at 7:30 in the morning." As for the relationship rumours, Virtue and Moir told Hassan that they now see it as a "compliment" because it means that they're doing their job as storytellers on the ice. "I think it's cool," said Virtue. "You know, I think this friendship and the business partnership we've been able to cultivate — I think it's almost better. What we share is this entirely different level and scale. I mean, we cherish it so much, clearly. We're very protective of it and very proud. I think it's probably what I'm most proud of in our entire career." If you missed Virtue and Moir on their Thank You Canada Tour this year, the pair have announced another big tour for 2019 with more details to come. Produced by Emma Godmere. Written by Vivian Rashotte.